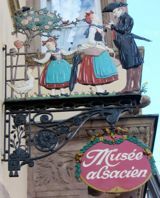 Strasbourg has a variety of museums—something for everyone! The Museum of Modern and Contemporary Art opened in 1998 and includes collections from the late 19th century to the present time. The Zoological Museum was built in the 18th century and will fascinate children and adults with its diversity of animal life. The Planetarium has the third largest dome/lens in France, as well as a filmed reconstruction of the sky and a collection of astronomical instruments. The Tomi Ungerer Museum/International Centre for Illustration has 800 drawings by Ungerer, a Strasbourg-born artist and illustrator. 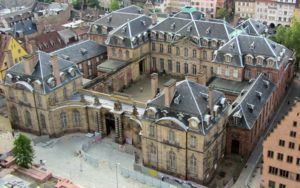 You can use your Strasbourg Pass for free or reduced entry to the museum of your choice. Above, Palais Rohan, home to three museums. 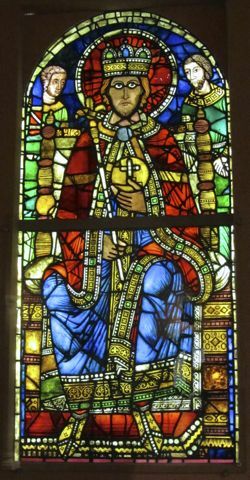 Below, King in Majesty, 12th century stained glass in the Musée de l'Oeuvre Notre-Dame.